I searched this forum for this answer, but only found info on early black and white colored plows. The '76 Cub I just picked up has the 1-bottom plow attached and it has what appears to be original faded blue paint on it. I know the 50's era plows were blue, but were they still blue in the 70's as well. What I'm trying to determine is if the plow is the same age as my tractor (1976). Were there any production changes in the plow design that would date it to certain blocks of time and were they painted blue until the end of production? While we're at it does anyone know a paint code for the original blue color.....or the name of a current paint available that matches? 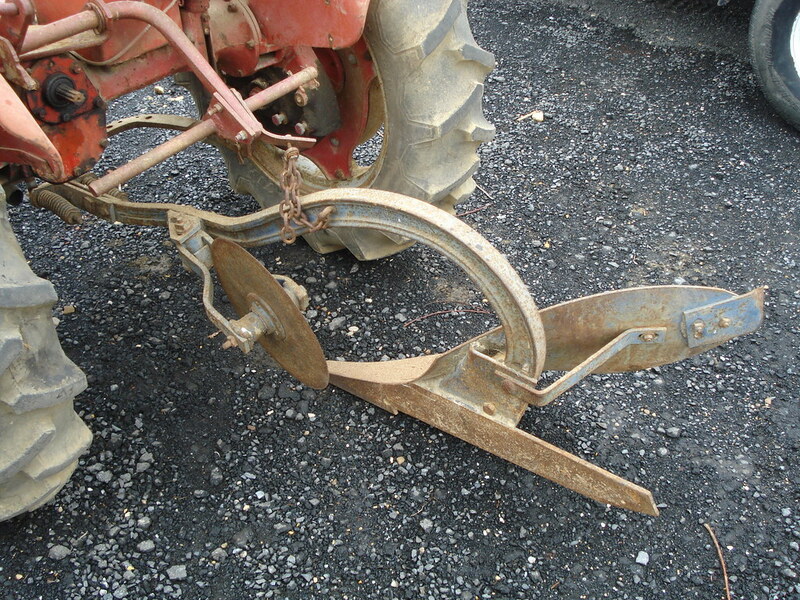 By the mid/late 1970s, all implements were white frames, the plow blade would have been black. Here is a photo of a larger plow, but from the same era, mid/late 1970s. Based on that plow bottom, I would say it's an early plow on a late tractor. Yes, an early plow. It doesn't have the side chain, which was added some time around 1950 or 1951. By the way, the rear rockshaft was made by removing the no-longer-needed parts from a manual lift unit. Nice Cub in the pics. Below is the Cub 193 Plow owner's manual. It has lots of info, and parts lists. It looks like the plow has the optional moldboard extension, not sure of the name, I didn't see it in the manual either. It bolts on the rear of the moldboard, with the 2 bolts. It is broken off, they originally stuck out the back about the same length as the part bolted on the moldboard. The part sticking out has a slight twist, to match the moldboard. It helps the soil roll over more after it is plowed. Remember to check or change all the fluids in the Cub, the transmission, final drives, steering gear, air cleaner oil cup, Touch Control, engine coolant, etc. I asked about the shade of blue used a few weeks ago and was told Krylon "True Blue". A big rattlecan at WalMart was around $3.50ish the other day when I looked. The plow also isn't attached to the rock shaft the way intended. That extension the chain is bolted to isn't original. Originally there was a special type of S hook for the attachment. Of course the S hook was easy to lose. What's there shouldn't hurt anything though. On mine I put an eye bolt through the rock shaft and attached the chain with a quick link. I also used a quick link on the plow end of the chain. That way I can shorten it to help get on to the trailer without losing track of how much chain I need when working. Did you get the depth adjusting lever with the plow? Thanks for the info! 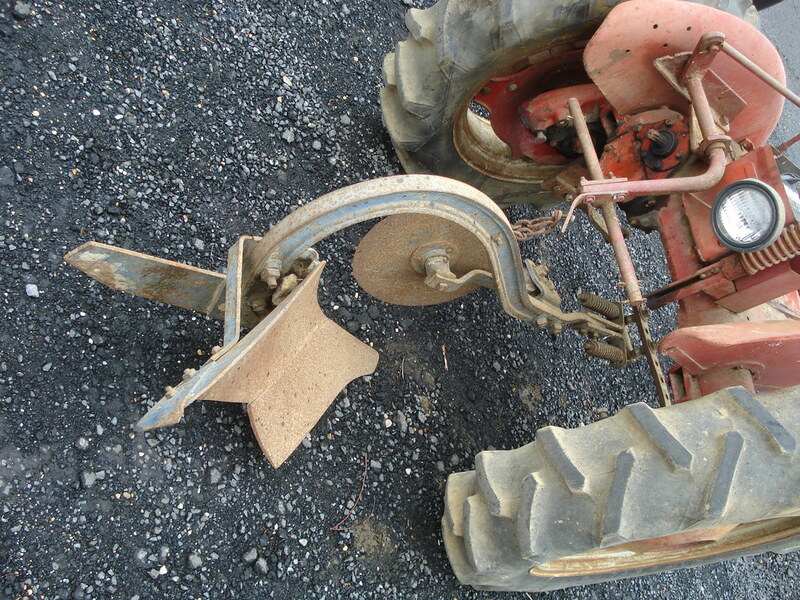 I found pics online of the moldboard extension part that's broken off my plow that Glen talked about. Didn't find a name for it though. Dale...........good catch. The fan in my '59 goes exactly a year before she starts telling me she needs oil. I wonder how many folks never put a drop in there. Carl's right, I know the hook he's talking about.....sort of half "L" and half "S", they're on ebay. I plan to take the plow off and hang it in my barn next to plow for my '59. But I'll blast it, POR-15 it and hit it with a coat of paint first. I always thought the color blue the implements were painted was a great color. They should have painted the Demonstrators that color! Sorry, couldn't resist. Ooops.........just saw your post Shane. The depth control lever didn't come with it, but I have a real nice one already hanging in the barn with my other plow. I see they're around too............maybe I'll pick one up at the next auction. These plows were only going for $50 or so at the auction, so implements seem to be pretty cheap. I just sold a 193 plow with the handle for $100 about an hour ago, the plow was wore out but the handle was in good shape. I wasn't going to use it and no point in hanging onto it so I let it ride. Which would explain the drawbar bolted and not floating.